A delightful tapestry showing children playing in the garden. 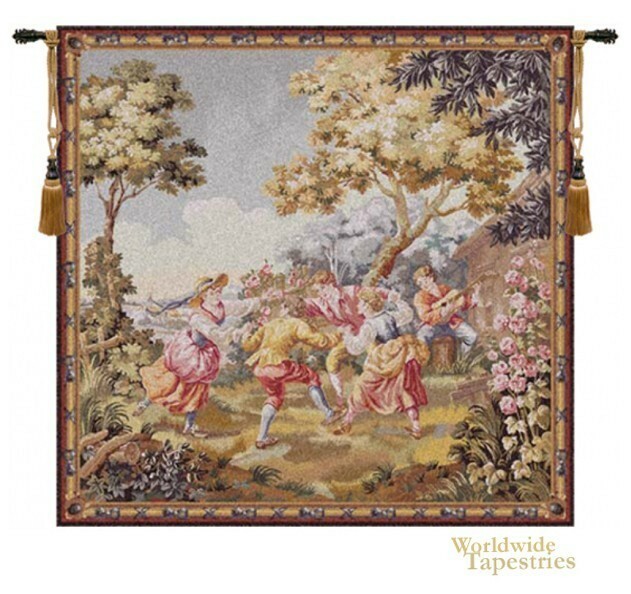 This tapestry is based on a nineteenth century original in a private collection in Chateau d'Enghien a famous chateau in Belgium. Bursting with movement and color, this tapestry shows the epitome of Belgian tapestry making with fine detail, harmonious use of color and an idyllic composition. The children are playing a game in the garden while another plays a guitar to accompany them. This verdure tapestry features elements of nature of trees, foliage and abundant flowers together with that of playing children. This tapestry is backed with a lining and a tunnel for easy hanging. Note: tapestry rod and tassels, where pictured, are purchased separately. Dimensions: W 76" x H 74"